Mount Baker is a neighborhood in southeast Seattle. 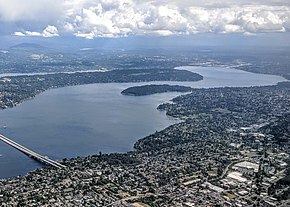 The neighborhood's name comes from the view of Mount Baker in Whatcom County, that is seen by looking north over Lake Washington. It is bounded by Lake Washington to the east, Interstate 90 and then Leschi to the north, Rainier Valley to the west, and Columbia City to the south. The neighborhood has a community club and a rowing team. It hosts Seattle's annual Seafair, which includes an airshow featuring the U.S. Navy Blue Angels, hydroplane races, a fireworks show, and other festivities. Franklin High School and Garfield High School serve this area. It is part of Seattle's South End. The Mount Baker Community Club is a volunteer non-profit neighborhood association located next to Mount Baker Park. The organization hosts community and private events at the Mount Baker Community Clubhouse, as well as park and open space stewardship programs around the Mount Baker neighborhood. In addition, the organization publishes a newsletter to support members with community news, events and historical interest stories. Wikimedia Commons has media related to Mount Baker, Seattle, Washington.